Holly Thompson masterfully offers two of my favorite distinctives in an excellent literary novel: a rich sense of place and a protagonist so real you've acquired her as a friend by the end of the story. In ORCHARDS (Delacorte), we're transported to an orange grove in rural Japan with all five senses engaged. We explore layers of grief, anger, courage, and hope in a world shattered by suicide through the sometimes funny, sometimes heartbroken, always honest voice of half-Japanese, half-Jewish American eighth-grader Kana Goldberg. I enjoyed the confidence Kana displayed when describing her mixed cultural heritage: "They seem to think | I can just switch | one half of me | on | and leave the other | half of me | off | but I’m like | warm water | pouring from a faucet | the hot | and cold | both flowing | as one." Thompson isn't Japanese but has lived there for years, so the novel's take on the culture from the perspective of an outsider with insider relationships and privileges rings true. I read through this lovely novel in verse in one setting, and so will most teen readers. I wasn't at all surprised to discover in the author's note that the novel reflects the nuanced, culturally-savvy editorial skills of Random House's Françoise Bui (who edited my own Monsoon Summer and Secret Keeper). 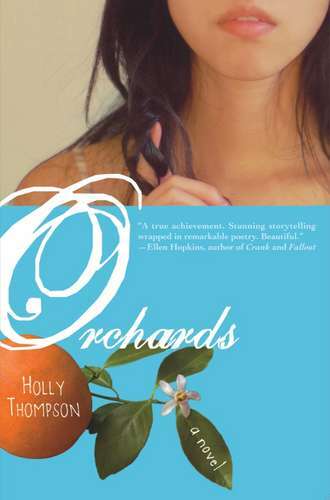 ORCHARDS won the 2012 APALA Asian/​Pacific Award for Literature and received a starred review in School Library Journal.